See Also - The Han Dynasty and the Tang Dynasty history. Silk Road (11) Modern History of the Silk Road 2: 1950 to 2000 A.D.
7 AM Greenwich Mean Time, October 16, 1964 - China successfully exploded its first atomic bomb in the Lop Nor Desert, a famous desert location along the Silk Road in the Bayin-Gholin Mongol Autonomous Prefecture in eastern Xinjiang Uyghur Autonomous Region . 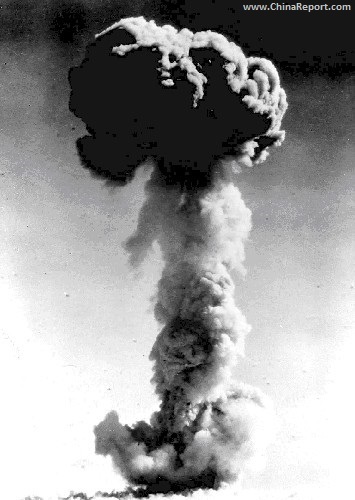 The first Chinese atomic test designated by China as test 596 (In the west code named Chic-1) was an atmospheric blast of a uranium based nuclear device which yielded an explosion of around 22 kilotons of TNT (equivalent). The device was rigged to a 102 meter high metal tower. The exact location of the explosion is today known as "the Lop Nor Test Ground" or also as Malan Base . It is a remote and very exclusive Chinese military base situated at coordinates: 40°48′45″ North, 89° 47′ 24″ East, about 70 kilometers northwest of Lop Nor dry lake . The succesful nuclear test 596 and explosion propelled China and its Leadership into the realm of World Super Powers, making China the 5th nuclear nation in the world after joining United States, the Soviet Union, Great Britain, and France. The test, which came just two months after the Tonkin Gulf Resolution (a congressional resolution giving President Lyndon B. Johnson the power to respond to communist aggression in Vietnam ) raised the bets in the conflict in Asia and raised the specter of nuclear confrontation and conflict in Southeast Asia i.e. war between China and the U.S.A. for the first time. On the same day as the test explosion took place, the Chinese Government made a solemn promise to the world that it developed nuclear weapons only for the purpose of self-defense and safe guarding national security. In the public statement China obliged itself never at any time or under any circumstances be the first to use nuclear weapons. Historic Photo of Test 596 explosion at the Lop Nor testing ground taken from original Press releases to the world on October 16, 1964 AD. were manouvering near the explosion in order to test their endurance in these unique radioactive surroundings. The Test 596 was the first of around 50 athmospheric tests of nuclear devices that were to follow in the next 3 decades. READ MORE ABOUT THE CHINESE NUCLEAR TEST AND THEIR EFFECTS IN THE CHAPTER: "Lop Nor" , and sub-sections : "History of Lop Nor" and "Malan Nuclear Testing Facility" . Led by Yasser Arafat, Fatah (Faction of the Palestinian Liberation Organziation) guerilla's joined and intensified the long Palestinian-Arab War against Israel, whole operating from bases in various neighboring countries. August - 27 September 1965: Indo-Pakistani War of 1965; On 5 August 1965 between 26,000 and 33,000 Pakistani soldiers crossed the Line of Control in Kashmir dressed as Kashmiri locals headed for various areas within Kashmir. Indian forces, tipped off by the local populace, crossed the cease fire line on 15 August. Various skirmishes occurred throughout with Indian army units booking considerable success. September 1, 1965: The continuous low-level warfaring between the two seperated States India and Pakistan over control of territories in Kashmir flares into a major military confrontation as a Pakistani Armored Division strikes southward to capture strategic positions in Jammu behind Indian Lines, while Pakistani Airforce jets bomb military airfields in India in preparation of an armored invasion. Indian forces in Kashmir stopped the Pakistani armored advance while on September 6 Indian Forces in Punjab (State of India) succesfully attack into western Pakistan defeating Pakistani Forces. A complicated exchange of land and Air Forces ensues. The United Nations thereafter managed to negotiate and pressure both states into another state of cease fire which went into effect on September 27, 1965. Both sides withdrew to their positions prior to conflict. A year later an end of conflict declaration was signed (Tashkent Agreement; Januari 19, 1966), although it could not realistically be called a final peace agreement. To date, hostilities as well as civilian unrest plague both Pakistani- and Indian claimed parts of Kashmir. 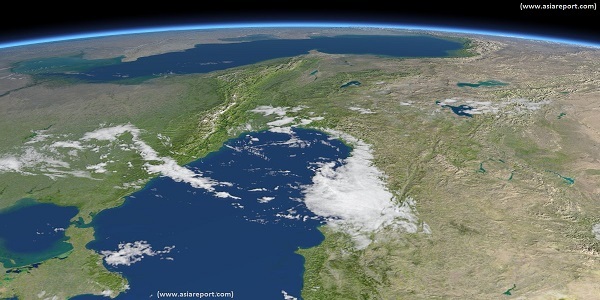 Earth Satellite Image showing the both the Black Sea (front) and Caspian Sea in one. On the left lies Russia, formerly the Soviet Union. In between both seas the Caucasus mountains and parts of Kurdish and Azerbaidjani Iran are also clearly visible. In the forefront and to the right lie parts of Turkish Anatolia. In 1952, reportedly, according to statements made by former Soviet Oil Minister Nikolay Baybakov and former KGB Ivan Serov, in the year before his death, Joseph Stalin came up with plans to drain the entire Caspian Sea in Central-Asia as a method of making the oil found underneath the sea easily accessible for tapping. According to the named sources, considerable research and planning was done, to see if and how this feat would be feasible, but the sources claim that Stalin was eventually talked out of this monstrosity of a plan. 11 August 1952: King Talal (Hussein) of Jordan is deposed for reason of mental instability. He is succeeded by his son Hussein bin Talal (Arabic: حسين بن طلال , Ḥusayn bin Ṭalāl; 14 November 1935 – 7 February 1999) who will remain ruler of the Kingdom of Jordan until his death in the year 1999. Under the new King Jordan will choose a modernist pro-Western appraoch to International Relations. 1957, Kham Province of Tibet, taken easily by the Chinese Peoples Liberation Army (P.L.A.) in 1951, was in chaos. After years of Chinese overlordship, an armed popular uprising of the Kham people occurs. Highly mobile units of Resistance fighters' attack Chinese strongholds all over the region leaving many Chinese dead in their wake. People's Liberation Army reprisals against Khampa resistance fighters such as the Chushi Gangdruk became increasingly brutal. Kham's monastic networks came to be used by guerilla forces to relay messages and hide rebels. News of the Khampa Uprising sparks of rebellions by Tibetans in Tibetan areas of current day Sichuan, Yunnan, Gansu, and Chamdo in eastern Tibet (Renamed Qinghai by China (P.R.C.)). In response, punitive strikes were carried out by the Chinese government against Tibetan villages and monasteries. Villages and Monasteries are shelled by artillery and bombed from the air. Tibetan exiles assert that threats to bomb the Potala Palace and the Dalai Lama were made by Chinese military commanders in an attempt to intimidate the guerrilla forces into submission. Chinese leadership is apt to take advantage of the uprising by using them as an excuse for a hard crackdown on Tibetan Culture and identity. The Kham uprising continues and rebel leaders make contact with the United States and its Central Intelligence Agency. On 1 February 1958, Syrian President Shukri al-Quwatli and Egypt's Nasser announced the merging of Egypt and Syria, creating the United Arab Republic, and all Syrian political parties, as well as the communists therein, ceased overt activities. Meanwhile, a group of Syrian Ba'athist officers, alarmed by the party's poor position and the increasing fragility of the union, decided to form a secret Military Committee; its initial members were Lieutenant-Colonel Muhammad Umran, Major Salah Jadid and Captain Hafez al-Assad. Syria seceded from the union with Egypt on 28 September 1961, after a coup. 1958: The ancient pre-silk road neolithic site of Catalhoyuk in Konya Province in the Anatolia Region in Central Turkey is excavated for the first time by James Mellaart. After the initial dig and a substantial waiting and preparation period, he returned in 1961 with a full archeological team in order to carry out further investigations which lasted through four full seasons. The digs and studies ultimately revealed that the location and area of central Anatolia were at the center of an advanced neolithical civilization in the period between 7500 B.C. and 5700 B.C. However, controversial publications by Mellaart as to the supposed origins and history of site caused an internatimal political row in 1965 (The Dorak Affair) resulting in Mellaart being declared persona non grata in Turkey and the Catalhoyuk site being closed on Government orders for a period which lasted for some 30 years. 1959: Massive environmental disaster begins to develop in the vanquished Nations of Central Asia ( Kazakhstan, Uzbekistan, Turkmenistan) as Soviet Engineers start diverting rivers which previously had flowed into the Aral Sea, the 3rd largest inland Sea in Asia. As a result of the drainage of waters in order to establish a cotton production monopoly through highly unsustainable means of irrigation and agriculture within 2 decades the Aral Sea loses most of its water volume. Villages and Towns around the lake lose their livelyhoods in the fishing industry while the previously lush and green wider regions turn to desert wastelands. The dying lake is left a pittance of its former size and highly polluted with industrial chemicals and pesticides and by 1997 the former lake bottom had become a sandy desert which has been emitting dust clouds frequently ever since. March 10 1959: Start if the so-called 1959 Tibetan Uprising in Lhasa, Tibet‍‍. While an armed rebellion has been ongoing in Kham Province of Tibet for some 2 years, relations between Tibetans and Chinese invaders come to a head in the Tibetan Capital City of Lhasa‍‍. March 17, 1959: Following a suspected Chinese plot to imprison him and an ensuing angry and defiant uproar amongst the populace of Lhasa, many thousands of whom then surround the Palace in order to protect their spiritual leader with their life and bodies, The 14Th Dalai Lama of Tibet slips out of the Norbulinka Summer Palace in Lhasa, Capital of Tibet starting is escape to India. On March 31, he reaches the Indian Border where he is safe from Chinese pursuers. It is the beginning of many decades of exile for the 14th Dalai Lama, while his people are being punished for their resistance in the most cruel of ways. The Peoples Liberation Army and Chinese Leadership decide to kill two birds with one stone, by making use of former Kuomintang Hui Minority Muslim Fighters, who previously fought with conviction against the atheist Communist Party until 1949. The Hui Army conscripts manage to force the Kham Rebels out of main population centers at a huge cost of life. By the end of 1957 order is seemingly restored in Kham Province, however the hatred for the Chinese Invaders continues to simmer underneath the surface. May 1958: In Lebanon at the western terminus of the Silk Road on the Mediterranean Sea, the Arab and Christian right-wing coalition mounted a Coup and Revolution against the pro-Western Maronite Christian Government led by Chamille Camoun. Chamoun, who himself had come to power in a 1952 Coup, holds out for a month but finding himself on the losing side, appeals for Western support an interference. On 15 July, The United States sends a 14000 strong expeditionary force into Beirut, Lebanon, there after forcing negotiations for peace. Camille Chamoun is forced not to run for another Presidential term after his current expires on September 22, 1958. Subsequently, elections make General Fouad Chehab President. In December the U.S. expeditionary force leaves Lebanon. Chamoun starts the National Liberation Party (of Lebanon) and is elected to parliament 2 years later to stay in politics for decades. July 14,1958: Iraqi coup d'état also known as July 14th Revolution. General Abdul Karim El Kassem leads a Baath Party army coup that deposed Faisal II King of Iraq. Faisal II and his Prime-Minister Nuri Al-Said, as well as Crown Prince Prince 'Abd al-Ilah, are killed as part of the Coup plan. Baath Party then declared the Republic of Iraq (Arabic: جمهورية العـراق) with Iraq becoming a de facto Arab nationalist and socialist one-party state. 1959: Iraqi Government military forces defeated two major insurrections. The first was an army revolt in the city of Mosul (May), the other was a substantial popular uprising in the oil city Kirkuk (July). 1959: Japanese writer, poet and novelist Yasushi Inoue (井上靖 Inoue Yasushi, May 6, 1907 – January 29, 1991) published the Novel " Tun-Huang " (Dunhuang) a story which is set in the surroundings of the mythical Silk Road wonder of the Mogao Buddhist Caves at Mogao Village, Dunhuang County-Level City , Jiuquan City Prefecture , Gansu Province , China (P.R.C.) . 1959: At some time in 1959, members of the Palestinian Diaspora (Palestinians forced out of Palestine) establish an organization named Fatah (فتح Fatḥ). Fatah is a Palestinian Nationalist Party which aims to reenergize the fractured Palestinian society and identity left after the establishment of the State of Israel in Palestine and the subsequent exodus of millions of Palestinians to neighboring and other states. The founders included Yasser Arafat, then head of the General Union of Palestinian Students (GUPS) at Cairo University; Salah Khalaf; Khalil al-Wazir; and Khaled Yashruti, then GUPS head in Beirut. In 1967 Fatah became the dominant politival movement among Palestinians in Palestine and subsequently joined the Palestinian Liberation Organization (P.L.O. )(Arabic: منظمة التحرير الفلسطينية) as its largest and most influential faction. Due to his continued leadership throughout several decades until his death in 2004, Fatah was closely associated with Yasser Arafat. 1960: After a decade of glowing friendship and great Soviet influence and respect in China (P.R.C. ), the friendship between both Socialist Nations is abruptly ended. An army of Soviet technical advisors and military cadres pack up their belongings and return home leaving China with unfinished factories and abundant other woes. Although their are lenghty historical analysis which point out that the rift had been established as early as the 1920's and essentially represented an old feud regarding the Russian financing and overlordship of the Chinese Nationalist Communist Revolution, the main acute reason for the break in relations was the continued differences of National interest combined with a beligerent attitude eminating from the Leadership of Mao Zedong in the Peoples Republic of China. In 1961 the Chinese Communist Party officially denounced the Soviet U.S.S.R. version of socialism as revisionist. Subsequently, friendship turned into hostility while China (PRC) claimed a position as an alternative model for the Soviet Union. With this, the old silk road from China into Soviet Central Asia fell silent while it's border passes were closed as hostile borders. This situation remained until well into the 1980's. 20 February 1960: Death of Sir Charles Leonard Woolley, British Archeologist who's excavations in the Middle East, most notably at Ur in Iraq (Mesopotamia) between 1922 and 1934 highlighted to the world the great importance of the Summerian Civilization in the history of the world. He was one of the first archaeologists to excavate methodically, and utilise records to reconstruct ancient life. 25 April 1960: Death of Amanullah Khan (Pashto: أمان الله خان, Persian: امان الله خان)(Life: 1 June 1892 – 25 April 1960), King of Afghanistan between 1919 and 1928 in Zürich, Switzerland. 1960: In Iraq , Kurdish Nationalist Leader Mustafa Al-Barzani (Kurdish: مسته فا بارزانی)(Life: 1903 - 1979) led another Kurdish uprising against the Central Iraqi Government. It is the beginning of a 10 year long war of Independence which only ends after Central Government promises for regional autonomy for the Kurdish Northern regions. 1961: British archeologists led by Kathleen Kenyon, the woman who earlier led the Britsih archeological team excavating at Jericho in the Jordan River Valley, start excavations in the Old City of Jerusalem (disputed) concentrating on the 'City of David' (Hebrew: עיר דוד ; Arabic: مدينة داوود) a site to the immediate south of the so called Temple Mount in the old city. Excavations will last through to the year 1967. The City of David is a known and legendary part of the city of Jerusalem as it exsisted during the Reign Period of King David. As such, although this remains speculative today, it is often regarded as the oldest and core part of the historic city of Jerusalem in the 2nd Temple Period (530 BC and 70 AD) which also had Herod's Temple (The Second Temple (Hebrew: בֵּית־הַמִּקְדָּשׁ הַשֵּׁנִי , Beit HaMikdash HaSheni). In subsequent years the ″ City of David ″ became one of the most extensively researched archeological sites in the world, revealing a history spanning between the Chalcolithic (4500–3500 BCE) Iron Age IIa (1000–900 BCE) through to the Byzantine and early Islamic Periods (324–1099 CE) of the city of Jerusalem. September 28, 1961: a group of officers staged a coup and declared Syria's independence from the Union with Egypt ending the United Arab Republic (UAR ; الجمهورية العربية المتحدة). 1962: After initial digs after discovering the Çatalhöyük site in Turkey in 1958, archeologist James Mellaart returns for more archeological excavations. His team discovers layers of historic remnants dated back to the period 6300 B.C. - 5500 B.C. A wide range of invaluable artifacts are recovered including stone sculptures, murals, obsidian mirrors and many other objects of daily life and ritual. Finds prove that the site was an important nodal point in a much wider regional trading network already some 8000 years ago. September 1, 1962: The 1962 Buin Zahra Earthquake strikes in the Buin Zahra Region of Qazvin Province, a region home to a multitude of historic mosques, ancient tombs and castles, in north-western Iran. Earthquake lights and sand storms reportedly erupt from the vault line ripping the surface, while landslides and rock fall increase the death toll. Some 12 thousand lives are lost, 21 thousand homes wrecked and some 35% of all lifestock killed. The shock was felt in Tehran (تهران), Yazd (یزد), Esfehan (Persian: اصفهان) and Tabriz (Persian: تبریز, Tabriz; Azerbaijani: تبریز, Təbriz). After the event, its strength is determined as between 7.1 and 7.3 on the Richter scale, and declared the largest earth rupturing event in the regions since the year 1630 A.D.
1963: In januari of 1963, the Shah of Iran announces his so called " White Revolution " , an especially for Iran, modernist policy which will include land reform, privatization and liberalization of the economy as well as social life, re-Nationalization of Forests, but also the establishment of full legal and electoral rights for women. Although it is a visionary proposal, the policy goes many steps to far in a Nation of which the rural populace is still steeped in religious tradition and social orthodoxy. By Januari 22, the fundamentalist religious leader Khomeini has denounced the plans as un-Islamic and a western attack on traditional Iranian values. Subsequently, Islamic Anti-Government rioting plagues Tehran, the Capital of Iran. The protestors are (Shiite) Islamic Fundamentalists who's main spiritual leader is the Ayatollah Sayyid Ruhollah Mūsavi Khomeini (Persian: سید روح‌الله موسوی خمینی‎)(Life: 1902 - 3 june, 1989). The riots are ultimately contained by Government Forces and the Ayatollah Khomeini flies into exile in France from where he will continue his direction of what will become the Iranian Islamic Revolution (in 1979). 1963: Ancient Nabatean Cliff carvings and ruins of Petra (Arabic: البتراء, Al-Batrā) are made a National Park of the Hashimite Kingdom of Jordan, with the ultimate goal of preserving all for posterity as is best possible. Youtube Video: Excavations of the Roman Silk Road border town of Zeugma on the Euphrates River in Anatolia: 2000 to 2004. 1987: First scientific excavations are started at the Zeugma (and Apama) archeological site discovered in 1970 on the west bank of the Euphrates River in the Anatolia Region of Central Turkey near Nizip (in Gaziantep Province). In the initial dig archeologists target a large cemetery where they excavate two magnificent tomb buildings which feature murals and statues. 1988: After unusual political events in Nagorno-Karabach lead to a secession vote requesting that the Nagorna-Karabakh disputed region be allowed to join with the neighboring state of Armenia, the Nagorno-Karabakh War between Azerbaidjan and Armenia erupts. It is the beginning of years of war ending in a cease fire and the effective Independence of Nagorno-Karabakh in 1994. Since, the region has been de facto Independent as the Republic of Artsakh (Armenian: Արցախի Հանրապետություն Arts'akhi Hanrapetut'yun) also known as Nagorno-Karabakh Republic. 1988: With Intifa Uprising ongoing in Gaza, Israel and the West Bank, the western bank area once more becomes a bastion of political support for the P.L.O.. Facing a repeat of history situation,King Hussein of Jordan dissolves Parliament and subsequently renounces Jordanian plans for development of the west bank and claims of territory thus allowing for the creation of Palestinian claims to this area. After King Hussein of Jordan proclaimed the administrative and legal separation of the West Bank from Jordan in 1988, the Palestine National Council adopted the Palestinian Declaration of Independence in Algiers, proclaiming an independent State of Palestine including the West Bank and with its Capital at Jerusalem. The declaration made reference to UN resolutions without explicitly mentioning Security Council Resolutions 242 and 338. A month later, PLO Leader Yasir Arafat declared in Geneva that the PLO would support a solution of the conflict based on these Resolutions. Effectively, the PLO recognized Israel's right to exist within pre-1967 borders, with the understanding that the Palestinians would be allowed to set up their own state in the West Bank and Gaza. The United States accepted this clarification by Arafat and began to allow diplomatic contacts with PLO officials. The Proclamation of Independence did not lead to statehood, although over 100 states recognised the State of Palestine. Only as late as in 1994 a very limited Palestinian Autonomy has been allowed by Israel, whereas further negotiations remain stalled as Israel sets up more colony villages on supposedly Palestinian lands. In addition, a long and tall wall (Israeli West Bank Barrier) been built by Israel in order to seperate Israel from neighboring Palestinian villages and lands in the west bank region. 17 August, 1988: Death of Pakistani Military Dictator General Muhammad Zia-ul-Haq (Urdu: محمد ضياء الحق )(Life: 12 August 1924 - 17 August 1988) in an airplane crash. It is the beginning a slow process of democratization in Pakistan . 20 August, 1988: With both Nations exhausted and stalemated on the battlefield, the Iraq-Iran War comes to an end. A UN mediated cease fire comes into effect on August 20, after which peace negotations start at the United Nations in Geneva. Soon after the cease fire goes into effect, Iraqi Dictator orders his troops to attack and supress Kurdish Forces and militants in restive northern Iraq (formerly supported by Iran for its own purposes). The Iraqi military uses all means available including poison gas, leading to recored massacres of entire villages. 7 December, 1988: In some 30 seconds a heavy earthquake laid waste to the cities of Spitak, Leninakan (Gyumri), and Kirovakan (Vanadzor) in western Armenia . Some 35 to 50 thousand people are killed while buildings and other structures are damaged on a large scale as the ground liquifies. 1989: Mareshra ancient historic city in Judea (Today: Beit Guvrin-Mareshra National Park in the Southern District of Israel), which is made a UNESCO World Cultural Heritage site many years later in 2014, is excavated by the Israeli archaeologist Amos Kloner. In 1992 the same archeological team also does investigations and extensive digs at Beit Guvrin (Roman Eleutheropolis). Important finds at the latter site were the amphitheatre built by the Roman army units stationed there, a large Roman bath house, and from the Crusader period a fortress integrating the walls of the Roman amphitheatre and bath house, as well as an attached church. 1989: Ouadi Qadisha (the Holy Valley ; (Arabic: وادي قاديشا) and the world renowned Forest of the Cedars of God (Horsh Arz el-Rab ; Arabic: أرز الربّ Arz ar-Rabb "Cedars of the Lord"), the last remaining vestiges of the historic Cedar Forests of Lebanon, both situated in North Lebanon Governate of Lebanon is listed as UNESCO World Cultural Heritage site. 1992: Tomb Raiders target the Zeugma archeological site discovered in 1970 on the west bank of the Euphrates river near Nizip in Central Turkey. As is discovered after the alert, the robbers have left a large trench running through the center of the Zeugma site. Following up on the exposed dig, the archeology team from Gaziantep Museum discover remains of a luxurious roman villa with a spacious atrium supported by 8 pillars with additional rooms behind. Magnificent ancient mosaic floors are found inside. 1993: Jordan creates the Petra Archeological Park which is comprised of a few hundred square miles of mountainous and rugged canyon type country. This larger park encloses the Petra Cliffs National Park (in 1995 listed as a UNESCO World cultural heritage site) as well as other minor sites representing the ancient Caravan roads which once moved exotic eastern goods westwards to the civilization of Egypt, Greece and Rome. December 1994: Gelati Monastery, a medieval Monastery complex examplary for the Georgian Golden Age (late 11th to 13th centuries), situated south of the Caucasus Mountains near Kutaisi (City) in the Imereti Region of western Georgia, along with the Bagrati Cathedral (Cathedral of the Dormition or also: Kutaisi Cathedral) in the city of Kutaisi, are given UNESCO World Cultural Heritage status. In addition, the ancient historical monuments of the city of Mtskheta (Georgian: მცხეთა) first founded in the 5th century B.C. and in history the seat of the early Georgian Kingdom of Iberia (Kartli), as well as the holiest city in Georgian Orthodox Christianity, are made a UNESCO World Cultural Heritage (site). Early 1995: Afghan Taliban begin shelling of Kabul. In September of the same year forces of Ahmed Shah Massoud "Lion of Panshir" retreat from the Afghan Capital. By September 27 Taliban forces enter the Capital Kabul. 1996: Taliban (Pashto: طالبان) take control of most of Afghanistan , including the Capital Kabul . June 1996: Chinese explorer Yu Chunshun attempts to walk across the Lop Nor Basin and desert. Although prior to his attempt stashes of food and water have been left along his expected path in the desert, Yu Chunshun dies of dehydration, not having his next stash, which was within two kilometers reach. 2-7 December 1996; 20th Session of the United Nations world heritage committee. Monasteries of Haghpat (Haghpatavank (Armenian: Հաղպատավանք)) and nearby Monastery of Sanahin (Սանահին վանք), 10th century medieval monuments of Armenian Orthodox Christianity situated in Lori Province of northern Armenia, are inscribed on the UNESCO World Cultural Heritage list. 2000: Start of construction of the Birecik Dam which will be situated on the Euphrates River but a short distance from the Zeugma (and Arapa) archeological site discovered in 1970 and first excavated in 1989. It is a start of a frenzied quest for saving of the archeological treasures at Zeugma, before (most of) the site will be submerged by the rising dam lake. In the period between 2000 and 2004 many more ancient treasures and mosaics are recovered ultimately to be preserved and exhibited at the Gaziantep Provincial Museum in Gaziantep, Anatolia, Turkey. 27 November-2 December 2000 A.D.: At the 24th session of the United Nations world heritage committee, the Monastery of Geghard (Armenian: Գեղարդ, meaning "spear"), first founded in the 4th Century A.D. and the surrounding area of the Upper Azat (River) Valley near Goght (Armenian: Գողթ; formerly Goghot) village in Kotayk Province (Armenian: Կոտայք) of Armenia are listed as UNESCO World Cultural Heritage site. READ ON IN: Chronology Silk Road History (12) "History of the Silk Road in the New Millenium (2000 AD to Present)" >>>>>. In 1950: While the worlds eyes are focussed on the Korean conflict, Chinese (P.R.C.) Peoples Liberation Army units attack the until then Independent Nation of Tibet . Although it takes the army an enormous effort to push through to Lhasa, Tibetan resistance is but light. Soo‍n‍‍, Chinese Army units reach Lhasa , ushering in a entirely new era for all Tibetans. Although in the aftermath of the Invasion, by forced agreement Tibet is still nominally Autonomous within the Peoples Republic of China with the (14th) Dalai Lama as its prime ruler, via theocracy, in reality China prepares to make sweeping changes in the Tibetan Capital and all Tibetan Territories. A Dark period in Tibetan History begins. 28 April, 1951: The National Front Party (Persian: جبهه ملی ایران), led by Mohammed Mossaddegh (محمد مصدق) is voted into power in Iran. To the shock of western powers the Iranian Government moved to Nationalize the Oil Industry om may 1, 1951, with the purpose of using the revenue to benefit the Iranian People as a whole. In the Nationalization move all prior deals and contracts on oil, which had previously been exclusively the right of the Anglo-British Petroluem Company (Later: British Petroleum) which had been established to control the British Monopoly rights on Iranian Oil, we rendered null and void. Prime-Minister David Ben Gurion the first President of the unilaterally declared "State of Israel" (1949-1952) torn from the lands of Palestine by violence and manipulation. 26 November 1952: Death of legendary Silk Road explorer and adventurer extra-ordinaire, Sven Anders Hedin (Life: 9 February 1865 - 26 November 1952). In the period between the 1890's and the 1930's Hedin had traveled widely in Western-, Central and Eastern Asia, surveying and rediscovering large sections of the Silk Road and its history. The body of Sven Hedin remains buried in the cemetery of Adolf Fredrik church in Stockholm. March 1/2 1953: In his Kuntsovo Residence some 15 kilometers from the center of Moscow, Joseph Stalin, the vicious Dictator and Leader of the Soviet Union (U.S.S.R.) suffers a stroke. Although he survives, his state is critical. The patient is responsive but unable to speak. On march 5, Joseph Stalin dies. On National Radio Yuri Levitan, renowned news reader from the World War 2 Era, announced the death of Stalin to the Nation and the world. March 1953: U.S. Sceretary of State John Foster Dulles directed the Central Intelligence Agency (C.I.A. ), an organization headed by his younger brother, to draft plans to overthrow the legal Democratically chosen Government of Iran headed by Mohammed Mossaddegh. Various complex affairs happened subsequently, with an attempted Coup against Mossaddegh initally failing and the Iranian Shah, who had been exposed to be supporting the Coup, fleeing into Exile. Thereafter, with Parliament dissolved, the Presidency survived for a while. Ultimately however, after having the Shah Pavli reinstated as nominal head of Iran, it was Mossaddegh who fell from grace. By October, Mossaddegh was removed from power and, after a speedy trail by a Military Court under the Shah's supervision, put under house arrest until his death 3 years later. Many of his cabinet were tortured, imprisoned or executed. March 6, 1979: Following the Camp David Accords (1978) the Military Dictator and President of Egypt Anwar Sadat (Arabic: محمد أنور السادات) and the zionist extremist terrorist cell leader come Prime Minister of Israel Begin (מנחם בגין) sign a trailblazing peace treaty between two arch enemies. The treaty will go down in history as first peace treaty between an Arab State and the (illegally created) State of Israel. In the worlds elation, both will share a Nobel Peace Price aftwards. Israeli troops withdraw from the Sinai Peninsula, which they had occupied since the 1976 war. 1979 AD: After long political talks in the ongoing process of the thawing of relations between China and Japan, in 1979 a mixed Chinese and Foreign Expedition of experts and filmers is allowed to travel and record findings during a journey along the Silk Road in China for the first time. The job of introducing the magic cultural riches of China and the Silk Road falls jointly to China Central Television and NHK Japan TV with additional sponsorship among things by Veronica Television in The Netherlands. The epic journey and Documentary record the journey from Xian (ancient Chang An) to Kashgar in the Xinjiang-Uyghur Autonomous Region , among the way shedding light on the many historical locations and finds done by the heroic early travelers and explorers of the silk road. Youtube Video: The Classic 1979 Silk Road Documentary Episode 1; start your Journey on The Silk Road at ancient Chang An in China. Recorded in 12 45 minute deliveries, the Documentary "The Silk Road" becomes an all time classic among Silk Road Documentaries. 16 June 1979 - 28 February 1982: After 3 years of sporadic rioting and revolting in the aftermath of the Syrian Armed Invasion of Lebanon in 1976 (possibly with Iraqi support), a full on Sunni Islamic Uprising against the Alawite Christian-sectarian Government led by General Al-Assad sweeps across Syria. On June 16 cadets of a military school in Aleppo are massacred. Main Cities of Damascus , Hama, Aleppo, Palmyra and Jisr Ash-Shugur see full scale urban warfare between Arabs and Alawites resulting in 2 and a half years of major violence from both sides in which civilians are also deliberately targeted. More and more massacres occur as the violence spirals out of control. 16 July, 1979: De Facto leader behind the scenes Saddam Hussein (Arabic: صدام حسين عبد المجيد التكريتي), forces ailing President al-Bakr to resign and subsequently assumes office as President of Iraq. Following his take over, on the 22nd of July Saddam Hussein calls a Baath Party Congress where he launches a bloody political purge. He would remain the ironfist leader of Iraq until his deposition at the hands of American Forces in the 2003 2nd Gulf War. 22-26 October, 1979: At the 3rd ever session of the United Nations world heritage committee, the ancient city of Damascus , ruins and remains of the historic Damascus, in modern times the Capital of the Arab Republic of Syria, is inscribed as UNESCO World Cultural Heritage site. During the same session of the United Nations world heritage committee, Naqsh-e Jahan Square (Persian: میدان نقش جهان Maidān-e Naqsh-e Jahān; translated as: "Image of the World Square"), a square situated at the center of the historic silk road city of Isfahan in central Iran (Persia), which was constructed between 1598 and 1629 AD, is likewise recognised UNESCO world cultural heritage. In 2012 the originally 8th century site of the Masjed-e Jāmé Mosque of Isfahan joins the square as crucial silk road monuments in that city. Also listed as UNESCO World Cultural Heritage site is the ancient city of Persepolis (Modern Persian: تخت جمشید Takht-e Jamshid), once the ceremonial Capital of the Achaemenid Empire (550 BC - 330 BC), today a ruined site some 60 kilometers north of Shiraz in Fars Province of south central Iran. November 4, 1979: In Tehran , Iran, the United States of America Embassy is overrun by religious revolutionary zealots who go on to take all personnel on site hostage. The unique Diplomatic Incident will lead to a memorable 444 day hostage affaire and International Crisis, which only ends with the installation of a new U.S. President (Ronald Reagan and defeated Jimmy Carter and became President on January 1, 1981. Carter lost the elections mostly due to his perceived weak handling of the Iran hostage crisis. Much later, a scandal revealed secret negotations and an illegal arms deal between parties associated with Ronald Regan and the that time Iran Goverment). December 1979: With the Soviet backed but weak Afghan Central Government having lost control of most of its outlying Provinces, the Soviet Union launches a massive invasion of its armed forces into Afghanistan . Some 150 thousand Soviet Troops take up operations within that Country in a fight against resilient guerilla forces increasingly financed and backed by Foreign donors and financiers. It is the beginning of Afghan-Soviet War (December 1979 - February 1989). On December 25, Soviet Paratroops take control of Afghan Capital of Kabul , leaving installed President Hifizullah Amin dead in the Presidential Palace. Babrak Kamal is installed President on December 27. January 20, 1980: Ronald Reagan is inaugurated President of the United States. Subsequently, Iran releases all remaining hostages ending the 444 Iran Hostage Crisis, leaving Iran in utter political isolation. June 17, 1980: Chinese scientists Peng Jiamu (Life: 1925 - 1980) leading an expedition to the Lop Nor desert disappears. According to the story of his death he left a note saying he wandered into the lake basin in search of water. Even though extensive search mission are organized, his body is never found and Peng Jiamu is not heard of again. 22 September, 1980: Iraq invades Iran beginning the protracted and bloody Iraq-Iran War (Sept. 1979 - August 1988). The Iranian City of Abadan (Persian: آبادان Ābādān) near the border with adjacent Iraq was almost overrun during a surprise attack on Khuzestan Province by Iraq. This event marks the beginning of the Iran–Iraq War. For 12 months Abadan was besieged, but never captured, by Iraqi forces. In September 1981, the Iranians broke the siege of Abadan. Much of the city, including the oil refinery which was the world's largest refinery with capacity of 628,000 barrels per day, was badly damaged or destroyed by the siege and by bombing. Previous to the war, the city's civilian population was about 300,000, but before it was over, almost the entire populace had sought refuge elsewhere in Iran. Summer 1981: a stalemate war develops in Afghanistan. July 28, 1981: The 1981 Sirch (also Kerman) earthquake occurred at 00:22 local time (17:22 UTC) on July 28. It had a magnitude of 7.1 on the surface wave magnitude scale and a maximum perceived intensity of IX (Violent) on the Mercalli intensity scale. The epicenter was in the province of Kerman in eastern Iran. The earthquake caused the destruction of Kerman and serious damage to towns and villages in the surrounding area. The estimated death toll was 1,500, with a further 1,000 injured, 50,000 homeless, and extensive damage in the Kerman Region. This is the largest event in the Kerman province since the 1981 Golbaf earthquake that killed 3,000 people. The 2003 Bam earthquake was the most significant earthquake in the Kerman Province. 1982: Although not officially until 1985, in Lebanon the Palestinian and Shi'Ite Muslim Terrorist organization Hezbollah (Arabic: حزب الله Ḥizbu 'llāh, literally "Party of Allah" or "Party of God") is founded. February 2, 1982: Following the taking of the city of Hama in Syria by Muslim Rebel Forces and their call for a nationwide uprising against the Assad Government, the dictatorial Syrian Government counter responds with a brutal military offensive. The infamous Hama massacre (Arabic: مجزرة حماة) began on 2 February 1982, when the Hafez Syrian Arab Army and the Defense Companies, under the orders of the country's president Hafez al-Assad, besieged the town of Hama for 27 days in order to quell an uprising by the Muslim Brotherhood against al-Assad's government. In the Battle for the City large parts of the historic old city are laid waste. Following the fall of Hama Syrian troops going on a killing spree. The massacre of some 3000 to 5000 civilians and rebels, carried out by the Syrian Army under commanding General Rifaat al-Assad, effectively ended the campaign begun in 1976 by Sunni Muslim groups, including the Muslim Brotherhood, against the government. June 1982: China Daily, the Peoples Daily Newspaper and other Chinese Government Media outlets proudly announce the reopening of various National Monuments and Temples; first among them the shrines at the Four Sacred Mountains, as well as the famous White Horse Temple (Bai Ma Si) in Luoyang, Henan Province which is the supposed first ever Buddhist Temple in China and also the original Buddhist Alma Mater of the famed Silk Road traveler, the Master Monk Xuanzang (Life: 602 AD - 664 AD). June 1982: Israeli Armed Forces cross northward into Lebanon, quickly surrounding Palestinian Liberation Organization forces in Lebanon and Beirut while remaining Syrian Forces in Lebanon are driven back into the Bekaa Valley. A Treaty in August ensures that Syrian Forces and P.L.O. leave Lebanon. In August, International Peace Keeping Forces enter Beirut which much fanfare. In the aftermath, on September 14, Lebanese Premier Gemayal was assassinated, later leading to Christian on Arab revenge attacks. 1983: Civil War in Lebanon continues unabated, including in the city of Beirut where an International Peace Keeping Force is present but unable to have much influence. In October P.L.O. Forces are evacuated from Lebanon from Tripoli. On 23 October, a massive suicide truck bombing brings down the U.N. Peace Keepers Barracks in Beirut at a cost of hundreds of lives. April 1983 AD: In the ongoing Soviet-Afghan War a series of Soviet aerial bombardments described as "extremely heavy, brutal and prolonged carpet bombings"‍ damaged half of the silk road city of Herat (Persian: هرات‎,Harât ,Herât; Pashto: هرات‎; Ancient Greek: Ἀλεξάνδρεια ἡ ἐν Ἀρίοις, Alexándreia hē en Aríois; Latin: Alexandria Ariorum) and killed an estimated‍‍ 3,000 civilians in the city and its wider valley. An estimated 50 airplanes per day targeted the rebel city in a 2 week air campaign while‍ Ismail Khan was the leading mujahideen commander in Herāt fighting against the Soviet-backed government of Afghanistan . 1984: Mongolia creates the Ar-Toul National Park, at a former game reserve near its Capital Ulaanbataar . It is the second National Park in Mongolia entire. 1984: Roman ruins of Baalbek in Lebanon are granted UNESCO World Cultural Heritage status. In addition, the Armenian Heritage Town of Anjar (عنجر ; Armenian: Անճար) including ruins dated to the Umayyad Caliphate period in the 8th century A.D. situated in the Bekaa Valley also in Lebanon and the ancient town of Byblos (Jubayl ; جبيل) in the Mount Lebanon Governate of Lebanon are also given the status of UNESCO World Cultural Heritage site. 1985: After Michael Gorbachev (Михаи́л Серге́евич Горбачёв) comes to lead the Soviet Union (U.S.S.R.) as Secretary General of the Communist Party (of Russia), General Secretary of the Central Committee of the Communist Party of the Soviet Union (March) as well as Chairman of the Supreme Soviet of the Soviet Union (May) , the Soviet Union starts negotitiations with the Afghan Taliban about a withdrawal of Soviet Troops from the ongoing Afghan-Soviet War and Afghan Civil War. Stooge Afghan ruler Badrak Karmal was deposed in a Soviet supported Coup D'Etat bringing (Dr.) Mohammed Najibullah (Pashto: ډاکټر نجیب ﷲ احمدزی) to the post of President of Afghanistan. While Michael Gorbachev struggles to lead and reform the Soviet Union first, little changes on the ground in Afghanistan and Afghanistan's new Government is essentially overruled turning Afghanistan into a virtual Governate of the Soviet Union. 1985: Iraq-Iran War stalemates on the battlefield, prompting both Nations to start attacking eachothers population centers and civilian population with aerial bombardments and longe range rockets. It is a new escalation which will however bring little military or political rewards. December 6, 1985: Ancient ruins of Hatra (الحضر) along the ancient silk road in northern Iraq are made UNESCO world cultural heritage site. The ancient Nabatean City of Petra in Jordan, gem of the western Silk Road, is granted status as UNESCO world cultural heritage site, as is the Quseir Amra (قصر عمرة) desert castle in Zarqa Governate of the Kingdom of Jordan. In the same 9th session of the U.N. heritage commission, the Great Mosque and Hospital of Divriği (Turkish: Divriği Ulu Cami ve Darüşşifası), constructed along the route of the Silk Road and the Persian Royal Road in the years 1228–1229 A.D. in Sivas Province in Central Turkey is inscribed as UNESCO World Cultural Heritage. In addition the old city parts of Istanbul, previously Constantinople, Capital of the western Roman Empire and later Capital of the Ottoman Turkish Empire, are made UNESCO world cultural heritage. Furthermore, Göreme National Park and the Fairy Chimney Rock Sites of Cappadocia in Nevşehir Province in Central Anatolia Region, Turkey is also listed on the UNESCO listing. Also listed as UNESCO World Cultural Heritage are the Old City (--) and Old City Walls of the city of Jerusalem, a Holy City for Judaism, Christianity and Islam, currently a disputed territory in Israel and Palestine. November 1986: The ancient old city of Aleppo, largely buried underneath the current modern day city of Aleppo in Syria, is declared a UNESCO World Cultural Heritage Site. In addition, in the same 10th session, the Ancient City of Bosra, in the Governate of Daraa in Syria, as well as Ḫattuša, the ancient Bronze Age Capital of the Hittites, a ruined site near Boğazkale, Çorum Province, in the Anatolia Region in Turkey, are made a UNESCO World Cultural Heritage site. 7-11 December 1987: Nemrut Dağ also Nemrut or Nemrud (Turkish: Nemrut Dağı; Kurdish: Çiyayê Nemrûdê ; Armenian: Նեմրութ լեռ), a 2,134-metre-high (7,001 ft) mountain in southeastern Turkey, notable for its summit where a number of large statues are erected around in what is assumed to be a royal tomb from the 1st century BC is inscribed as UNESCO World Cultural Heritage site at the 11th session of the United Nations world heritage committee in Paris, France. As for the Silk Road in China; the epic late 3rd century B.C. Terracotta Warrior Army and the according Mausoleum of Qin Shi Huang (First Emperor of Qin) begets a World Cultural Heritage status, grating the Tyrant Emperor who sought to become immortal his ultimate wish. Since, the UNESCO site near Lintong ranks in the top of most famous places to visit in all of the Peoples Republic of China. 8 December, 1987: Start of the so called Intifada (انتفاضة intifāḍah) or "First Intifadah" (8 December 1987 - 13 September 1993) in occupied areas of Palestine (West Bank, Gaza Strip and Israel), yet another popular (Palestinian) uprising against the perceived illegal occupation of Palestinian lands by the unilaterally created State of Israel and brutal marginalization and repression of Palestinians in Israel and the occupied areas in general. Although the Israeli Army (IDF) responds with brutal force it is the beginning of great civilian unrest which will last and simmer for years. 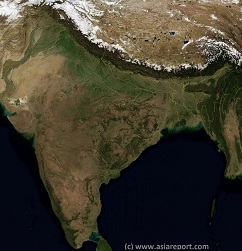 A SatelliteImage based overview Map of India entire, including a large part of North-West Pakistan, Nepal, Bhutan, Bangladesh and Tibet Autonomous Region of China. Parts of Yunnan Province of China and Myanmar (Burma) are also visible. 29 May, 1953: Sherpa Mountaineer Tenzing Norgay ( Sherpa: བསྟན་འཛིན་ནོར་རྒྱས) and Edmund Hillary, the latter a New Zealand born explorer and mountaineer, are the first ever humans to ascend to the top of the highest mountain in the world, which is Mount Everest, better known locally among Tibetan as Chomolungma (ཇོ་མོ་གླང་མ) and in Nepal as Sagarmāthā (सगरमाथा). The two make the ascend to the 8,848 metres (29,029 ft) top of the mountain via the so called south coll, reportedly staying at the top for only some 15 minutes. With the worlds highest mountain conquered, the pair become world famous. On 6 June 1953 Hillary was appointed Knight Commander of the Order of the British Empire and received the Queen Elizabeth II Coronation Medal the same year. Tenzing Norgay was honored in Nepal by King Tribhuvan of Nepal who presented him with the Order of the Star of Nepal, 1st Class (Supradipta-Manyabara-Nepal-Tara). In addition, the Government of India awarded him the Padma Bhushan, the third highest civilian award of India in 1959. In 1954 Tenzing Norgay continued a rewarding carreer as the first Director of Field Training of the Himalayan Mountaineering Institute in Darjeeling (India), when it was set up in 1954 receiving many more honors in the following decades. Time named him one of the 100 most influential people of the 20th century after his death in 1986. 8 August 1953: Indian Politician Sheikh Mohammed Abdullah (Urdu: شیخ محمد عبد اللہ) (Born, 5 December 1905 – Died, 8 September 1982) also known as "Sher-e-Kashmir" (Lion of Kashmir), thrice the head (Prime-Minister) of Indian Rule in Kashmir after its ascension into (Federal) India in 1947, was dismissed as Prime Minister of India by the then Sadr-i-Riyasat (Constitutional Head of State) Dr. Karan Singh essentially for advocating for self-rule (regional autonomy) for Kashmir (Heavily disputed between Pakistan and India, but previously in history and Independent State). Subsequently he is accused of crimes and imprissoned for a period lasting up to April 1964, when Mohammed Abdullah was cleared of all charges. He then returned to Kashmir. 1955: 6th World Buddhist Council meets in Rangoon, Burma (Today: Myanmar). After 2 years of deliberations a new authorized text of the Tripaka Buddhist Canon is introduced to the world. 1955: Cambridge Professor Joseph Needham, previously a Chemist, then a Historian of Science and also Zoologist, and much later dubbed "The Man who loved China" by author Simon Winchester, starts publication of the Book or rather Encyclopedia which would become his life's crowning work. His book, the massive multi-volume "Science and Civilization in China" was the first and to date the most complete work on the historic contributions of Chinese Civilization to the Science know to man. This book is available from University Libraries all over the world, and is also published in various electronic formats. 1956: Armed conflict between Tibetan rebels and the People's Liberation Army (PLA) had started in the Kham and Amdo regions, which had been the first to be subjected to Chinese styled socialist reform. The guerrilla warfare later spread to other areas of Tibet and lasted through 1962. Only in 1972, through the Nixon-Mao political deal, United States support for Tibetan Rebels was halted, forcing an end to armed rebellion in Tibet. 1956: Near the coastal city of Haifa in the Levant of the western extremes of the Silk Road, Israel establishes the Mount Carmel National Park (Hebrew: פארק הכרמל, Park HaKarmel), which is to be the largest National Park and nature reserve area within this state. The park covers some 10,000 hectares of mountainous terrain of the Mount Carmel Mountain Range and is overgrown with pine, eucalyptus, and cypress forest and includes some 250 historic archeological sites, most of them dating to pre-Silk Road era's. 18 June, 1956: Golda Meir (גולדה מאיר) named Foreign Minister of Israel (June 18, 1956 - 12 Januari, 1966). In November 1956, as a direct result of the Suez Crisis, Syria signed a pact with the Soviet Union. This gave a foothold for Communist influence within the government in exchange for military equipment. Turkey then became worried about this increase in the strength of Syrian military technology, as it seemed feasible that Syria might attempt to retake İskenderun. Only heated debates in the United Nations lessened the threat of war between Syria and Turkey. 1957: Archeologists of the Iraqi Nation Department of Antiquities start another excavation at Khorsabad (Dur-Sharrukin) in north Iraq . They uncover the Temple of Sibitti. 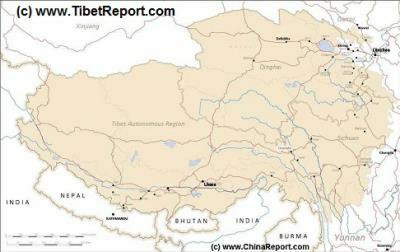 A Schematic Map of Historical Tibet, today Tibet Autonomous Region, Qinghai Province and a part of Sichuan province. Included for reference are current International Borders, provincial borders, locations and names of main cities and towns, main rivers and lakes, mountains, important Tibetan-Buddhist Monasteries and other places of significance. Further Reports link to More Photos and History & Backgrounds of each City, Town or Ethnic Community of Yugur, Dongxiang Tibetan, Lhoba, Kazakh, Mongol or others where available. Today Tibet only exists as Tibet Autonomous Region of China. Tourist visits require an aditional visa ! Front Party led the National Government in Iran between 1951 and 1953, after which Mossaddegh found himself deposed through a anti-Democratic Coup D'Etat skillfully planned by the United States Central Intelligence Agency (C.I.A.) at the request of the British (U.K.) in order to restore cheap western access to Iranian Oil (as had been the case prior). Mossaddegh was imprissoned for 3 years until his death while many members of his Cabinet were brutally executed by the new Military Government. It was the end of Democracy in Iran in the 20th century. 1951: United Natipons Relief and Works Agency for Palestine Refugees (UNRWA) is established. It would become the major International Relief Agency dealing with Palestinian refugees in Palestine, Syria, Jordan and other Palestinian Area's. 20 July, 1951: Murder of Abdullah Ibn Hussein (Arabic: عبد الله الأول بن الحسين)(Life: 1881 - 1951), Son of Hussein Ibn Ali - leader of the 1916 Arbian Revolt against the Ottoman Turkish Empire, previously the Emir of Trans-Jordania and later the first King of the Hashimite Kingdom of Jordan (Reign: 1946 - 1951). The King is succeeded by his Son Talal Hussein. 1952: President Bishara el-Khoury of Lebanon was forced to resign amid corruption allegations. Subsequently, a Maronite Christian coup makes Camille Nimr Chamoun (Arabic: كميل نمر شمعون) the new President of Lebanon. 1952: First archeological excavations commence at the biblical city of Jericho (Arabic: أريحا Ariha or Tell Es-Sultan ; Hebrew: יְרִיחוֹ Yeriḥo), the lowest city in the world situated in Wadi Qelt in the Jordan River Valley of the Kingdom of Jordan. In the period between 1952 and 1958, the British archeological team led by Kathleen Kenyon (Life: 5 January 1906 – 24 August 1978) uncovers the entirety of the ruins of ancient Jericho some dating to 9000 years previous, yielding countless historical artifacts to be studied further. The find establishes Kathleen Kenyon as one of the foremost archaeologists in the field. May 29, 1964: Founding of the Palestine Liberation Organization (P.L.O. ), with as Chairman Mahmoud Abbas and co-founders Yasser Arafat, etc. The largest faction within the P.L.O. will be the earlier established organization for Palestinian National Salvation known as Fatah (Arabic: فتح Fatḥ). Although originally intended as the founding of a Government in Exile and an according National Army, it becomes a National Liberation Army. The aim of this organization is the Liberation of (the land of) Palestine through armed struggle and the National salvation of Palestine and all Palestinians. The main opponent will be illegally and unilaterally declared State of Israel and its various means of aggression against- and repression of Palestinians and their rights. It is recognised as the "sole legitimate representative of the Palestinian people" by over 100 states with which it holds diplomatic relations. its corrupt counter-revolutionaries and creating an entirely classsless completely egalitarian communist society. As a means to an end, Mao Zedong's left wing creates the Red Guards, which quickly grows into an army of fanatical zealots who devour Mao's every word as a religion. Originally first created in Beijing , the Red Guard movement quickly establishes in all localities and all Provinces across the Nation. Subsequently, as part of the Revolution the campaign against the 4 olds (old custums, old culture, old habits and old ideas and though) emerges, a rather unspecified campaign which quickly spires out of control leading to the nationwide destruction of ancient cultural and historical heritage. Throughout the provinces Red Guards zealously attack old Temples, statues, buildings, objects and even street names in a frenzy of destruction. Along the Chinese eastern side of the Silk Road many ancient monuments suffer significant damage, or are left completely destroyed. 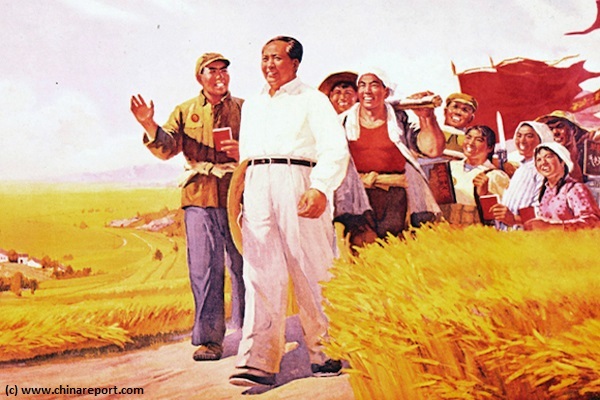 An Idyllic Cultural Revolution Era Propaganda Poster depicting Mao Zedong as the God-like Man leading a happy peasantry down the path of enlightenment trhough total collectivation. In reality, it was an utter disaster which directly led to the next economic revolution, the positive effects of which would be claimed by Deng Xiaoping as his ideas and heritage. in North Shanxi Province , reportedly sustains relatively little damage. Similarly, at the remote Maijishan Buddhist Caves in Tianshui Prefecture of Gansu Province , Red Guards do (relatively minor) damage to statues breaking of fingers and noses. In the far west at the Mogao Caves in Dunhuang advancing Red Guards are prevented from entering the village of Mogao and damaging the ancient Silk Road relics of the Mogao Caves. Throughout the Cultural Revolution Era and even until the year 1982, all Temples, Mosques and Churches remain closed. March 5, 1967: Death of Head of the National Front Party (of Iran) and President of Iran 1951-1953, Mohammed Mossadegh (Persian: محمد مصدق) while under house arrest at his residence in Ahmadabad. May 18, 1967: Egyptian President Gamal Abdel Nasser declared a state of Emergency in Egypt and subsequently demanded a withdrawal of United Nations troops from the strategic and for western Europe economically vital Suez Canal. The Arab Nations gear up for yet another war with Israel. On June 5, Israel largely preempts Arabian Military moves by attacking airfields in Egypt, Syria, Jordan and Iraq. The Egyptian, Syrian and Jordan air forces are left largely destroyed while the Iraqi Airforce takes major damage. In the next 6 days Israeli Armored and infantry units with air support once more expand Israeli Territory and take the Jordanian Western half of Jerusalem, the so called West Bank of the Jordan River from Jordan, the Golan Heights from Syria and the Sinai Peninsula from Egypt. Yet again, the United Nations manages to pressure and broker a cease fire (June 10), but no peace treaty can be signed. Some 3000 Palestinians are pushed out of Jerusalem and the West Bank Region whereas some 100 thousand Syrians flee the Golan Heights for safer territories. Israel, the state not recongnized by its neighbors, does not withdraw its troops from new territories occupied. 1967: In Palestine Palestinian Commando's step up their attacks against Israeli targets from bases in neighboring Lebanon. In response Israeli retaliatory raids and strikes into Lebanon also increase in number. The political implications and demands from all sides upon the fragile Government of Lebanon increasingly destablizes this Nation as well.